A heartfelt cry from the Kununurra Community to the Nation now fighting to stop the cane toad from crossing into WA since Sept. 2004. Kimberley Toad Busters Media Releases 2010. Kimberley Toad Busters Media Releases 2008. Kimberley Toad Busters Media Releases 2007. Kimberley Toad Busters Media Releases 2006. Kimberley Toad Busters Media Releases 2005. Private research shows the way. Parasites catching up to the front line toads. Toads 3.4 Klm from W.A. / N.T. border. 200 hundred livers and ten hearts. What's in ypur backyard launch. Native frog / cane toad. 3.4KMS FROM WA/NT VICTORIA HIGHWAY BORDER! … and it is still raining! WHAT WILL HAPPEN TO OUR ICONIC TOPEND FISH and BIRDS? “The Lake Argyle community is really gearing up for cane toads, since the KTB reconnaissance team found a cane toad just off the Duncan Road in the Matilda Creek, around 5kms from the north east corner of Lake Argyle 2 weeks ago but still just in the NT,” Lee Scott-Virtue. “The estimated 18 – 28,000 freshwater Lake Argyle crocodiles should also be getting clear about the difference between cane toads and native frogs – it only takes one cane toad swallowed to kill a crocodile,” Sandy Boulter. Supporting DEC researchers to study the biodiversity in the Lake. Photo : Below the dam wall (far right), which is home to some very large crocodiles. 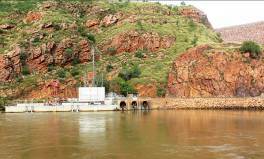 The Lake Argyle community is about 70 kms from Kununurra. About 20 people live there running camp grounds, chalets and tours; and managing the water, the lake, and the pump and plumbing infrastructure. 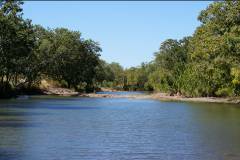 The East Kimberley has had a very wet, wet season. “This means that the KTBs have not been able to access all the cane toad breeding areas as often as we would like. As the first sign of wattles is now being seen signalling the start to the onset of the dry season, the KTBs wait to see where the toads are and how much breeding has happened at the front lines,” Mary Anne Winton, KTB Aboriginal Coordinator. 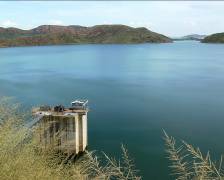 “Lake Argyle’s diverse ecosystem, extremely popular with visitors who come to see the huge variety of wildlife, will be dramatically affected by this invasion”, Greg Smith, Lake Argyle tour operator and resident also airing everyones’ concerns. 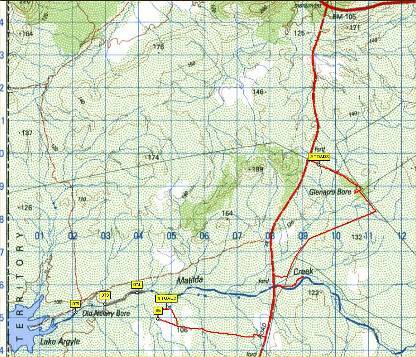 Map to right shows the recent reconnaissance on the NE corner of Lake Argyle by KTB volunteer John Cugley . 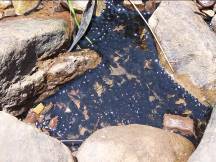 Cane toad eggs and early stage tadpoles are lethally toxic to fish, birds and crabs that ingest them. and then next morning dead beside billabong from cane toad toxin ingestion. 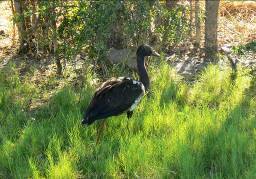 Magpie Geese are special and are referred to as a, “biological blast from the past” (“Western Australian Wetlands” Giblett and Webb) in the waterfowl world to which they belong. They are quite different from the 148 species of other ducks and geese around the world. Lake Argyle is a WA Ramsar site. The Ramsar Treaty recognises wetlands of international significance around the world, especially in their significance as waterfowl habitat. 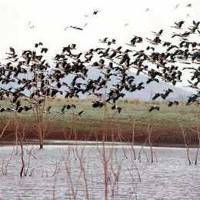 The Treaty includes the adjacent shores of the identified wetlands, many of which, in the case of Lake Argyle are perfect cane toad habitat The shallow shores on the south east corner of Lake Argyle is prime waterbird habitat. 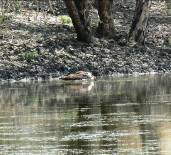 Bird species on the Lake number at least 240 (prior to cane toads). It was estimated in 1988 that the SE corner of the Lake supported 20,000 waterfowl. Lake Argyle largest fish is the massive “Silver Cobbler”, which can weigh up to 40kg. It feeds on fish (probably including tadpoles) and crustaceans. “Sooty Grunter” and increasing numbers of barramundi are found in the Lake, as are a number of other species. 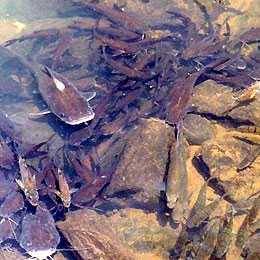 Close reading of the Northern Territory Fishnote shows that a lot of the fish information is educated guesswork because there has not been sufficient research into the impact of cane toads on freshwater fish. 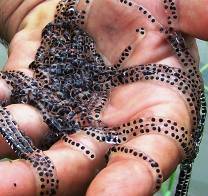 The Fishnote does state that cane toad eggs and tadpoles can poison freshwater fish. However, the Note says that barramundi have been seen to spit out cane toad tadpoles, which it is assumed is because of the bad taste. The NT Fishnote also suggests that high toad numbers could poison freshwater. Spits out toad tadpoles with no obvious effect. May eat cane toad eggs and die. Does not eat tadpoles. May die, even after spitting out cane toad tadpoles. Known to be affected by cane toads. Some fish may learn to not to eat cane toad tadpoles. May attack and kill cane toad tadpoles, but not swallow them. As over 2,000 Kununurra based registered Kimberley Toad Buster award acknowledged volunteer toad predators enjoy their FOURTH YEAR of WEEKLY hunting and gathering cane toads over 200,000 sq kms as a way of life, they are working hard slow and thin the invasion numbers, to save native species from extinction by the cane toad invasion and to preserve the maximum amount of genetic diversity within each native species population that survives. Cane toads in all this stages of their life cycle poison just about all fauna that eat them, pollute waters of ecosystems and use up food resources. The KTBs have caught, weighed, measured, killed and recorded over 253,000 adult cane toads; and countless millions of tadpoles and metamorphs (thereby taking over 150,000 kgs of cane toad biomass out of our already threatened precious NT desert eco-systems) with the help of private donations, Lotterywest, and the federal and WA State governments. As at February 2009, the KTB toadbusting comprised an estimated 490,000 volunteer field hours (and including support and administration hours it is probably closer to 950,000 volunteer hours. At $20 an hour, this equates to a lot of volunteer work value.